William was the eldest of 8 siblings born to John and Elizabeth, nee Ralph. John was born in Dorchester in 1861 and Elizabeth in Southampton in 1866. They married in Southampton on 12th April 1886. Both parents died in Southampton, John in 1924 and Elizabeth in 1935. William married Violet Mary Morant in Southampton in 1911 and they made their home at 13 Milton Road. In the census of that year it is shown that William is working as a Marine Clerk. In 1913 their only child was born, Winifred Mary Violet. Winifred married James B. Dobson in 1942 and passed away in December 2013 at the Avon Park Residential Home in Park Gate, having achieved the milestone of her 100th birthday. Ellen M b.1893 Southampton and d.1958 Southampton. Married William C Mabbett in Southampton in 1915. Lilian Daisy b. 29th April 1896 Southampton and d.1989 Kingston-upon-Thames. Married Reginald F Aldis in Southampton in 1919. Daisy and Reginald sailed for New York on 28th June 1956, on the Queen Mary. Violet May b.1899 Southampton and d.1991 Southampton. Married Robert G Langley in Southampton in 1932. Harold Victor b.1903 Southampton and d.1989 Portsmouth. Stanley Ralph b.1906 Southampton and d.1979 Winchester. The Hampshire 11th (Service) battalion was formed at Winchester in 1914 as part of the Second New Army (K2). It moved to Dublin and then on to Mullingar in Eire. In December 1914, the battalion became part of the Pioneer Battalion of the 16th Division. The Division arrived at Aldershot in March 1915 and was mobilised for war on 18th December 1915, landing at Le Havre two days later. In 1916 the Division took part in the Battle of Guillemont and, in the latter part of that year, in the Battle of Ginchy. On the 9th September the Division captured the German-held village. It was at the junction of 6 roads and on a rise so was an important strategic capture. It was here that William lost his life. The Germans threw everything at the Division in the subsequent days, trying to retake the village, but without success. Education & Employment: William was born on 20th June 1887 in Southampton. While at Taunton’s he had an article on a school visit to the Echo office published in the journal. He worked as a Marine Clerk at the Docks after leaving school. Life during the War: William married Violet Morant on 16th July 1911 in St. Luke’s Parish Church and they lived on Milton Road in Southampton. Their daughter Winifred was born in 1913. William was Company Quartermaster Sergeant for the A Company of the 11th battalion of the Hampshire Regiment. He died in France alongside 30 other men from the same battalion and is remembered on the Thiepval Memorial. 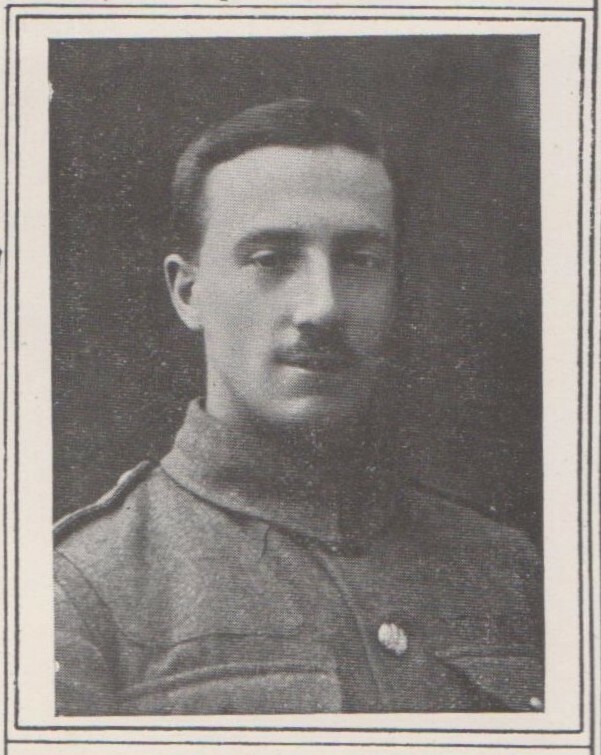 William died on 9th September 1916 aged 29 years.